Jennifer Kinon and Bobby Martin are designers and educators who co-founded OCD (Original Champions of Design). Together they develop brand identity systems for a broad range of clients that include, among others, the National Basketball Association, Girl Scouts of the USA and Friends of the High Line. Their work has won awards from the Art Directors Club, D&AD, AIGA365, Type Directors Club and Print as well as Best of Show and Judge's Pick in the 2011 Brand New Awards. 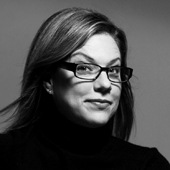 Jennifer Kinon recently served as the president of AIGA/NY. Prior to founding OCD, she worked in the New York office of Pentagram with Michael Bierut, served as design director of New York City’s 2012 Olympic Bid and worked as art director for Graphis Inc. She graduated from the University of Michigan and earned an MFA from the School of Visual Arts. Kinon is the first program graduate to join the faculty. Prior to founding OCD, Bobby Martin developed brand experiences from the inside out while leading internal design teams at Nokia, in London, and Jazz at Lincoln Center. He has also served on the board of directors of AIGA/NY. He teaches identity design at The Cooper Union and recently joined the faculty of his alma mater, the School of Visual Arts, MFA Design Program where he holds a graduate degree. He graduated from Virginia Commonwealth University.